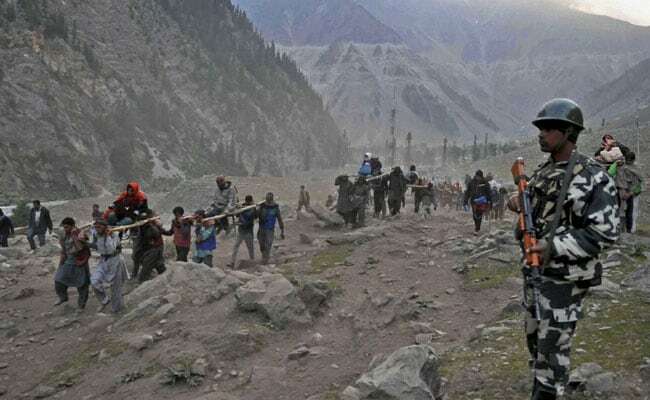 Security personnel will be deployed along two routes during the Amarnath pilgrimage in Jammu and Kashmir which begins on June 29. New Delhi: Nearly 30,000 paramilitary personnel besides the local police will be deployed to ensure proper security for the Amarnath pilgrimage in Jammu and Kashmir beginning June 29. The security personnel will be deployed along the two routes during the pilgrimage to the high-altitude shrine dedicated to Lord Shiva. "Proper security arrangements will be put in place for the Amarnath yatra," a home ministry official said. Nearly 30,000 paramilitary personnel will be deployed besides the local police, the official said. The pilgrimage will begin on June 29 and conclude on August 7. The shrine is located in the Himalayas at an altitude of 12,756 feet and a distance of about 141 km from Srinagar. People who wish to trek to the shrine must furnish medical certificates, it said, adding those below 13 or above 75 years of age will not be allowed to join the pilgrimage. Home Minister Rajnath Singh, Jammu and Kashmir Governor N N Vohra and Union Home Secretary Rajiv Mehrishi are likely to to pay obeisance at the shrine on the first day of the pilgrimage.